Through their research, SMU professors not only bring new information and insights to their classrooms, but also serve as role models and collaborators to students who conduct research in their laboratories across campus. Maintaining a strong research program is significant for a number of reasons, says James Quick, associate vice president for research and dean of graduate studies. David Son uses some of the Earth's most common building blocks to create complex new materials with potential wide-ranging applications. Son conducts research on polymers containing silicon. One of the main elements in the Earth's crust, silicon is the major ingredient in common sand, and is readily available. 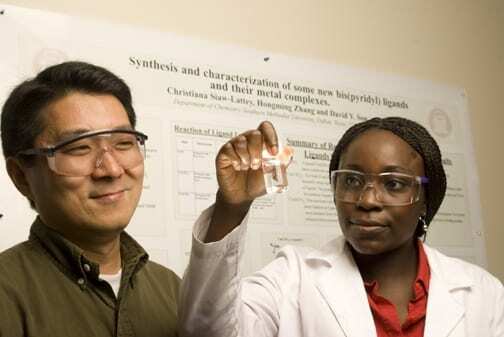 "It's fairly easy and inexpensive to transform silicon into compounds we can manipulate," says Son, associate professor in SMU's Department of Chemistry in Dedman College. "And because silicon is an inorganic element, it gives materials great stability against temperature changes and oxidation."